Director Michelle Steel is currently serving as the Second District Supervisor and Vice Chairwoman of the Orange County Board of Supervisors. She joined the Orange County Transportation Authority Board of Directors in January 2015. Elected to the Orange County Board of Supervisors in 2014 with more than 62 percent of the vote, Director Steel served as Chair of the Board in 2017. She represents the residents of Costa Mesa, Cypress, Huntington Beach, La Palma, Los Alamitos, Newport Beach, Seal Beach, Stanton, the unincorporated area of Rossmoor, and portions of Buena Park and Fountain Valley. 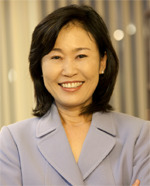 Steel, a successful businesswoman and renowned taxpayer advocate, previously served as Vice Chair of the State Board of Equalization where she represented more than eight million people in Southern California, including all of Orange County, as one of the state’s 12 constitutional officers. As a member of the Board of Equalization, Michelle Steel distinguished herself as the state’s leading tax fighter. Her hallmark first-term achievement was the discovery, that the Board of Equalization had delayed the return of millions of dollars in security deposits owed to California businesses. Following her investigation, the agency refunded tax security deposits worth upwards of $50,000 each to over 5,500 small businesses. Procedures were changed due to Steel’s decisive leadership and hundreds of millions of dollars were returned on time to taxpayers. In 2013, Steel succeeded in eliminating the agency’s automatic security deposit program, freeing thousands of Californians from what was effectively a tax on new businesses and allowing them to use their scarce capital to create jobs and grow the economy. As Southern California’s elected taxpayer advocate, Steel fought on the front lines of California’s perennial battle against higher taxes. In 2008, she successfully led the fight against a new iTax, a $500 million tax on digital downloads. Steel’s commitment to taxpayers began three decades ago when she watched her mother fight an unwarranted Board of Equalization tax bill. As an immigrant small business owner, Michelle’s mother lacked the resources to successfully fight a massive state agency and reluctantly acceded to the Board’s demands. Steel promises to protect taxpayers from the overbearing government that her family encountered. A signatory of the Taxpayer Protection Pledge, Michelle Steel will oppose all new taxes and tax increases. Over the past decade, Michelle Steel has served on the President’s Advisory Commission on Asian Americans and Pacific Islanders, California World Trade Commission, Los Angeles County Department of Children and Family Services, and Los Angeles Airport and Fire Commissions. Director Steel holds a degree in Business from Pepperdine University, an Executive MBA from the University of Southern California, and is fluent in Korean and Japanese. She and her husband, Shawn, have been married since 1981 and live in Surfside, California.